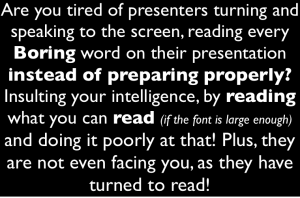 Audiences are often overloaded with too many facts in a presentation. Slide design tips: Many speakers think this is the best way to give their audience value for money. The speaker may feel that the information is important, but what does the audience actually need to know? “Consultant’s disease” is giving too much information, without discovering what the listener’s actual needs are. A simple example is when asked how to write a letter on the computer the “consultant” explains about the processor speed, the operating system, and the stability of the software. 90% of the information given, in this case, is clutter and does not speak to the need. All the listener needed to know was how to switch on, click word and then save, mail or print. When we gear presentations to the needs of the listener, the message does not get lost in the clutter. Despite good intentions data overload puts more obstacles in the way of audience understanding, and their ability to make choices. Use this Slide design tip to ensure your audience stays awake. Research over the last 20 years, by Professor Iyengar, shows that overloading people with too many choice (or too much data) reduces engagement in the process, the quality of decisions, and satisfaction with those decisions. Create an experience. Emotion sways our decisions more than facts do. 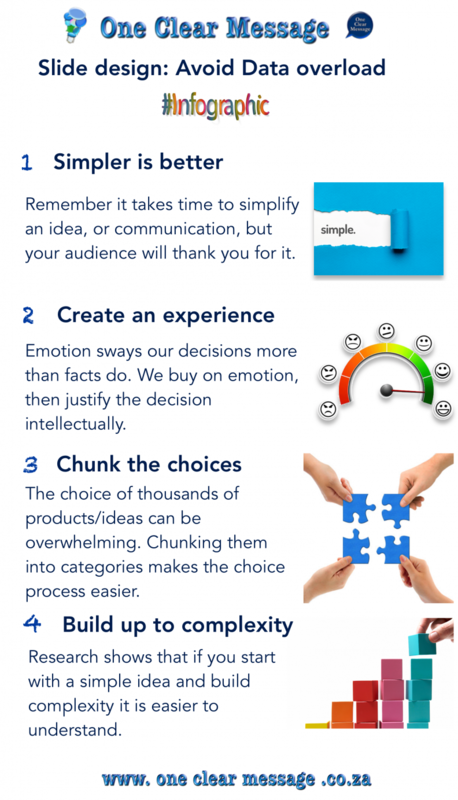 We buy on emotion, then justify the decision intellectually. A list of facts does not sway the heart. e.g. buying a house, is all about the feeling of the place, not just the list of what we want. Chunk the choices. Remember when, as a kid, you went into a sweet store with money burning a hole in your pocket. The choice of thousands of products can be overwhelming. Chunking them into categories (Chocolates, gums, etc) makes the choice process easier. Similarly with ideas. Too many facts in one go are hard to digest. Build up to complexity. Research shows that if you start with a simple idea and build complexity it is easier to understand. Think of a graph, with an x and y axis, adding one line at a time vs. showing all the lines at the same time. Having too many options, ideas or facts, just gets your listener more confused than they were at the beginning. 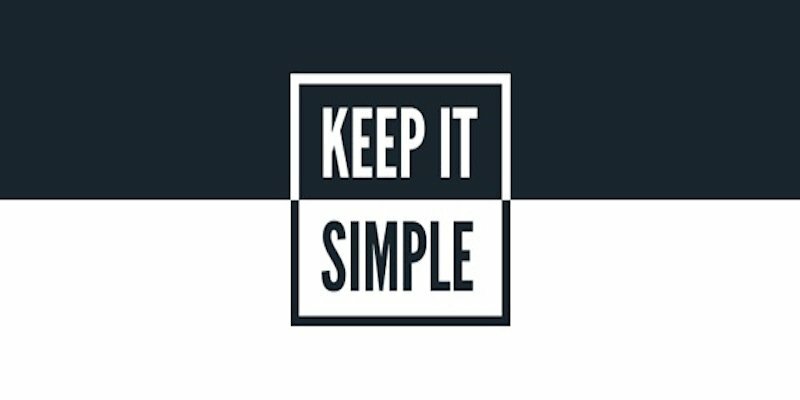 Keep it simple, with the needs of your audience in mind. If you really want to get your presentations right, consider hiring a professional presentation consultant to help. A professional can help you get perspective about what’s important, help you protect your brand and deliver clear powerful visuals which augment your message. If you need help with your Slide design contact us today.